Why Do Organic Chemists Use Kilocalories? One of the skills you have to develop early in Org 1 is to learn the different conventions for drawing molecules. Let’s use butane as an example. Butane is pretty boring molecule, frankly. It’s four carbons in a row. Not much more to it than that. However, even a simple molecule like butane can be represented a TON of different ways. The point of this post is to demonstrate a sampling of the many reasonable ways to draw it (along with a few ridiculous ones). First of all we have the three standard naming conventions. The line bond drawing – The first way we learn: clear, straightforward but lengthy. The condensed form – useful for simple molecules, and word-processor friendly – CH3CH2CH2CH3. Line drawings – The simplest, quickest, most effective way to draw molecules. Each line depicts a carbon-carbon bond, meaning that each “kink” in the chain (including the tips) represents a carbon atom. The trick here is to recognize that the carbon hydrogen bonds are “hidden” – meaning that even they’re not drawn, you’re supposed to know that they’re still there. As you soon see, however, it’s common that you’ll see these conventions not strictly followed. For instance I know many chemists who shy away from depicting a methyl group as just a straight line, because they’re worried that it might get neglected altogether or confused as a hydrogen [I do this a lot on this site by the way – sorry if this has caused any confusion]. So sometimes you see drawings like the following, which are hybrids of line drawings and condensed molecular formulae. Note that the CH3 can also be drawn as H3C because that way it’s more clear that its a carbon that’s bound to the rest of the chain. The molecules are EXACTLY THE SAME – exactly the same – but written a different way purely for aesthetic purposes. It gets more complicated from there of course. The CH3 group comes up so often that we have a common abbreviation for it – “Me”, for methyl. NOT to be confused with Metal. That’s different. 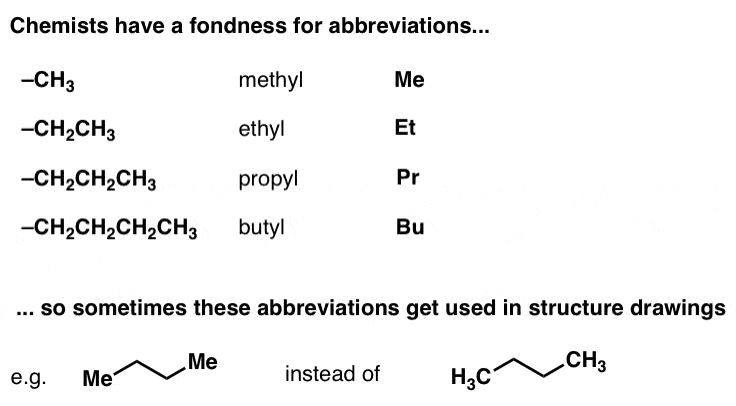 We can also use abbreviations for ethyl (Et), propyl (Pr), butyl (Bu), and so on. So replacing “CH3” for “Me” we can draw the following. Note that while it’s ridiculous to do so, Et-Et would also be a way of depicting butane, as would Bu-H. 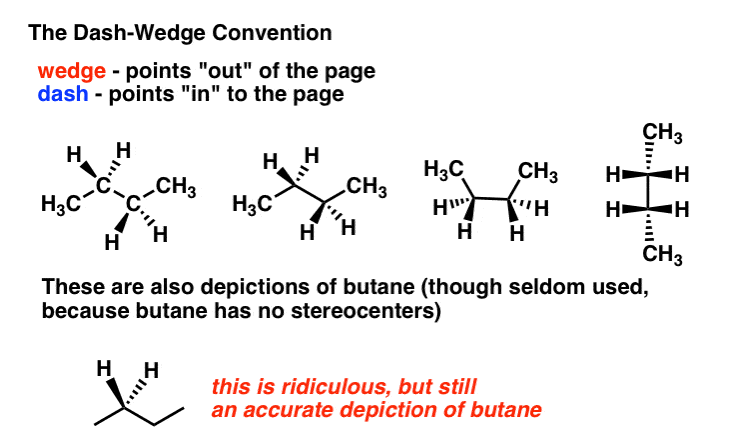 Ridiculous because there are so many better ways to depict it, but technically they still represent butane. And it can get more complicated when we try to depict these molecules in 3D. The dash-wedge convention is our way of depicting 3D molecules on a flat page. A wedged bond is pointing “out” of the page – if you were wearing 3D goggles, you could almost imagine reaching out in front of you and grabbing it – while the dashed bonds represents bonds that point away from you, back behind the page. We could also use the line to depict the carbon skeleton, while drawing in the bonds to hydrogen as dashes and wedges to depict them in 3D. It takes some practice to do this properly to make sure that the carbons get properly represented as tetrahedra. Finally there’s the projections – the sawhorse, Newman, and Fischer projections. The sawhorse is a side-on way of depicting molecules that clearly shows different orientations that we obtain through bond rotation (i.e. conformations). It’s a slightly more easily grasped way of visualizing conformations than the Newman but probably not quite as useful so it isn’t used as much. The Newman projection differs from the sawhorse in that it’s a front view – we look along one of the carbon-carbon bonds, and the view of the back one is obscured except for its bonds. You can imagine this as being similar to our view of a solar eclipse, where the moon completely blocks our view of the sun except for the corona which sticks out along the edges. The purpose of the Newman projection is that it makes it easy to visualize conformations. The original purpose of the Fischer projection was to provide a convention for easily depicting 3D molecules on a flat page, but this has largely been supplanted by the wedge and dash diagram. Although the Fischer projection is ordinarily not used for boring molecules like butane that lack any interesting stereochemistry, but you still see it used for molecules like sugars. You will definitely encounter it within the first few chapters of your textbook. 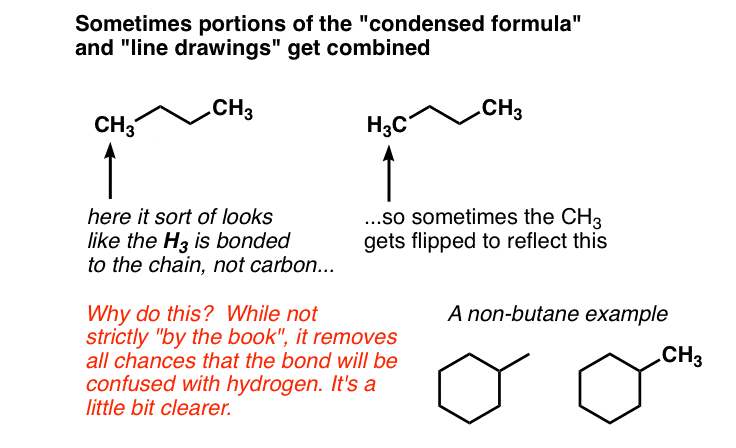 The bottom line here is that it’s important to understand that even a simple molecule like butane can be depicted in many ways, and although you initially learn about the three simple types of drawings (line-bond, condensed, and line drawings) there are a lot of hybrid forms that get used. Furthermore, once stereochemistry comes into play, there are dashes and wedges to worry about, as well as the sawhorse, Newman, and Fischer projections. I hope this all hasn’t been ridiculously confusing. Yell at me in the comments if necessary. Hey, was just wondering what the squiggly line branching out from the right-hand side represents. Ah! If you look at that carbon, it’s a stereocenter (attached to 4 different substituents). The squiggly line on the CH3 means that the compound is a mixture of the (S) form (where the CH3 points out of the page) and the (R) form (where the CH3 points into the page.